Does SHamp affect sound quality? No. Most of the sound comes from sound-board. 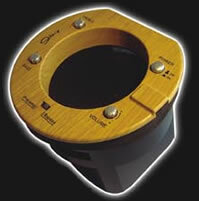 SHamp has 2 vent slots to allow natural sound from inside the guitar to blend with the amplified sound of SHamp. Will SHamp damage the guitar? optional and should not damage guitar surface. However, 1 clip should be used to secure adaptor lead in place. We recommend the adaptor lead be left plugged into SHamp permanently once installed. A short cable connects SHamp to the pickup jack. SHamp works with most guitars that have internal pickups with or without a pre-amp. With rechargeable 200mah batteries supplied an initial charge of 10 hrs is needed and will give approx 1 hr 15min continuous playing with 4 hrs charging thereafter. With good quality alkaline batteries up to 5-6 hrs continuous playing is possible. What if batteries need changing? Batteries are easily removed from battery pack and should be replaced/recharged when SHamp starts to distort. Batteries can be recharged without removing from battery pack with adaptor/charger supplied. SHamp can be used with external power. SHamp is made from light weight materials and weighs only 250g (8 oz) and because SHamp is centrally located in guitar the weight is distributed evenly over guitar body. There are no heavy spots to unbalance guitar. How easy is SHamp to fit? Fitting SHamp is a simple matter of checking sound hole size using 2 or 4 pieces of adhesive rubber mounting strip supplied - stick to SHamp and insert into sound hole. Fitting details are explained fully in instructions and should be read carefully before installing. SHamp is designed to give you more volume when needed mainly for soloing over other acoustic instruments and is easily switched on /off when required. Sound can be adjusted with volume/tone controls. Will SHamp work without a pick up? No. The guitar must be fitted with a bridge type pickup, with or without a pre-amp. SHamp has built in pre-amp /by pass modes and can be used in either mode. Will SHamp interfere with playing? No, as all controls are well below the strings. Can effect processors be used with SHamp? If using floor pedals an adaptor is required for leads to reach ground level and available at any audio/music shop. Small effect units are available and can be mounted on guitar and give full freedom of movement. A short lead is required to connect effects unit to guitar.